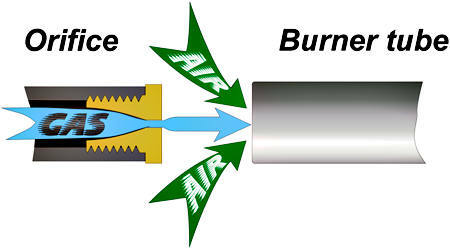 The gas orifice dispenses fuel into the combustion or burner tube through a small, high precision hole. The orifice delivers just the right amount of fuel to mix with the correct amount of air, to create just the right flame for the job in your appliance. If you change the size of this orifice either larger or smaller it can alter the operating characteristics of the appliance, maybe even with a disastrous outcome to life or property. For example: Say you have a 24,000 BTU furnace with a #52 orifice and you ream it out to #50. The diameter has now been changed from 0.063 inches to 0.070 inches. The flow rate will now be increased by 29% raising the furnace to approximately 31,000 BTU's or more. The furnace is now running hotter because the blower was only designed to handle 24,000 BTU's . If the orifice that delivers the fuel is blocked or dirty, it will no longer be able to deliver the necessary fuel to the appliance for proper combustion. Even the smallest particle in the orifice can have a major effect on the air/fuel mixture. When servicing the furnace be sure to check, and if necessary clean the orifice. When cleaning a blocked orifice, it is important that you do not make the hole any larger! Be gentle, and follow the instructions below. Soak the orifice in alcohol. Use an air hose with a high pressure nozzle to blow it out. As a last resort, use a tooth pick or the bristles of a tooth brush to clean it. Never use a drill bit, dental pick, Oxy-acetylene tip cleaner, or any other metal object to clean the orifice!